Emergency medicine is rapidly emerging as an important and indispensable branch of medical science on the landscape of the Indian medical scenario. Since the inception and initiation of organized emergency medicine as we know it today in the western world around the 60s and 70s there has been an exponential and holistic growth in this field. The Indian subcontinent felt the wind of change only in the 90s and since then Emergency Medicine has moved ahead in leaps and bounds. At Peerless Hospital and B. K. Roy Research Centre we believe in delivering the best in health care to all our patients at all times. The Emergency Department amply portrays this vision in all its myriad facets and activities. The Department has undergone a refit to transform itself into a very modern state of the art facility, in a fully equipped 19 bed Emergency Department with well trained Emergency Physicians. We have a dedicated trauma team with an operation theatre in the ED, and the support of a well recognized Orthopeadic Department and National Neurosciences Centre, consisting of Neurosurgical and Neurology Consultants. The ED caters to approximately 15,000 - 20,000 patients annually, of which 68% get admitted. We are one of the busiest Emergency Departments in Kolkata - setting high standards in patient care and are well-prepared to meet the demands of the emergency room. Our department is manned at all times by Emergency Physicians who have had specialist training in the field of Emergency Medicine. 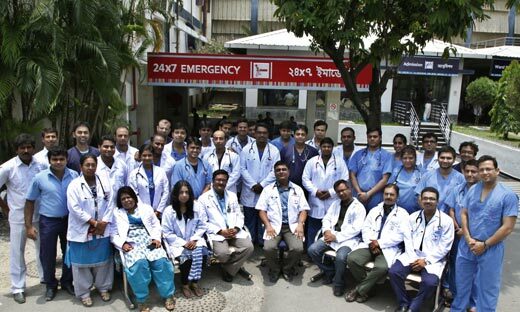 This is one of the few departments in Kolkata which has 24 hours consultant coverage in the Emergency Department. Our Department aims at not only achieving high clinical standards but also in setting a bench mark in academic excellence. In this regard the Dept of Emergency at Peerless Hospital is a pioneering institution in the eastern part of India. The department is actively involved in a wide range of academic activities including community CPR training, regular American Heart Association certified BLS, ACLS, PALS courses for doctors, nursing personnel as well as Emergency Medical Technicians and in house training of nursing and paramedic staff in basic emergency skills. We are privileged to be the International Training Centre (ITC) for the American Heart Association and are entitled to certify providers and instructors in BLS, ACLS and PALS courses. Besides the above - the principal academic activity of the department revolves around organization and conduction of a complete three years’ Emergency Medicine Residency Training Program. The course is conducted in collaboration with the George Washington University, USA. The course curriculum is extremely well designed and comprehensive providing in-depth knowledge and understanding of the specialty. As of date we have 39 residents pursuing the program in this department. Care to all the patients at par with the current international standards of emergency medical services. In the department we do not restrict ourselves to providing clinical cure – rather we lend that healing touch which is required to rejuvenate the ailing individual. Our motto is not just to deliver care but to deliver care with compassion and respect for the diseased individual. Peerless Hospital aims at escalating the quality of emergency medical services and academic emergency medicine to new heights in this part of the country. The horizon is wide with new vistas of opportunities emerging in this field with every passing day – at our hospital we hope and strive to be the torch bearers of modern emergency medicine in India.